I have been unable to find a pair of blue shoes that I love, so I am falling back on gold. I decided that, based on the shape of the front strap, I could add some blue shoe clips to fancy them up. 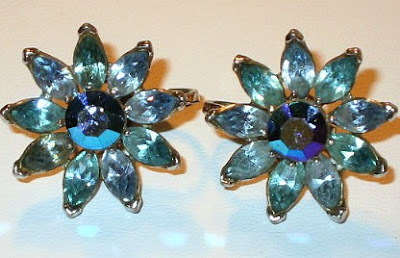 Shoe clips are hard to come by, but clip on earrings (also sold in pairs!) are not. Here are a few beauties that I have found on eBay and Etsy. Although these aren't blue, it might be fun to tie in the milkglass centerpieces. Has anyone else used or heard of clip on earrings as shoe clips? I am worried that they might be uncomfortable or fall off. I might have to do a test run with a cheaper pair before the wedding. Awesome idea!!! I've been looking for shoe clips, but this opens up a lot more possibilities. p.s. I wonder if the screw-on kind might stay on better (though then they leave you with a little thing sticking into the shoe). Just a thought. I've encountered the same blue shoe dilemma. Just haven't found any that I love- I never even thought about getting blue shoe clips! These are adorable!! I love them all! that's is exactly what i am doing-- i purchased some vintage clip on earrings and am affixing them to my shoes! what a great idea I love this one, I have dressed up a few pairs of shoes with vintage clip on earrings, but here is the thing. or maybe if you don't want them permanently on there some heavy duty double sided tape. other wise they will slide around or fall off. good luck... we want to see the outcome! My grandma used to do that all the time. I wish I could ask her how she kept them in place! Knottie vintageglam did the clip on earrings on her shoes, and they looked awesome! I wish she had commented on the level of comfort b/c I was wondering the same thing. What a great idea! I have somewhat of a 'difficult' color blue so clips might be the answer for me too! thanks for the fun tip! 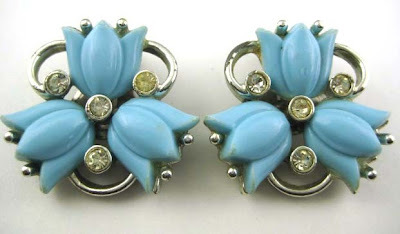 I'm doing the exact same thing, too -- I bought a pair of vintage blue flower clip-ons and am going to use them on a pair of sparkly silver ballet flats. You will probably have to take the little bendy part off and sew (or otherwise attach) the earrings to the shoes because A) you don't want an earring thing digging into your foot and B) it most likely wouldn't be able to stand up to all of the movement and you'll lose your shoe clips. 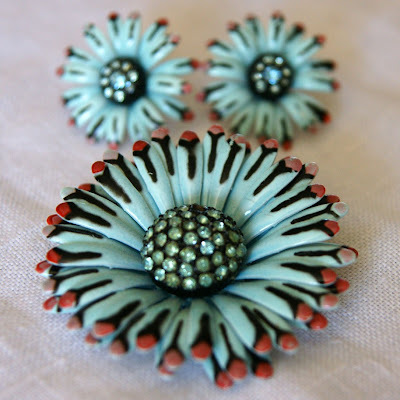 Leave the other part of the base on the earring -- they usually have holes so you can sew them onto the shoes. 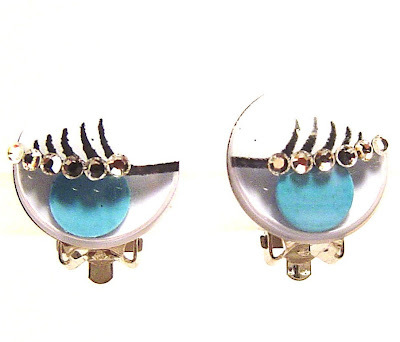 Plus, the earrings will lay flatter this way than if you just clip them on. It's worth the little bit of trouble because you can find such adorable and unique styles! I think you will lose the earrings if you just put them on your shoes. 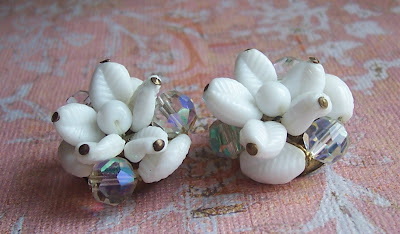 I've bought shoe clip blanks from here: http://www.craft-supplies-online.com/productdetail.asp?item_nbr=340-46-5320-503 that I've used to make shoe clips from vintage earrings. How pretty! 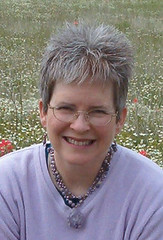 I found shoe clips at a stunning website that sells very chic ready-made shoe clips. They sell GORGEOUS handmade satin bow shoe clips too!